The country of Wales is famous for producing two things, the singer Tom Jones and also for mining many precious metals. 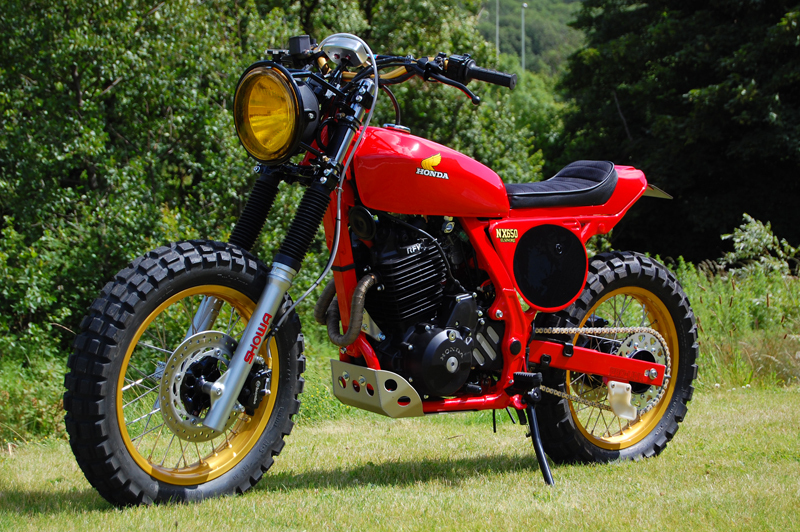 Ironically, precious metal was all that was left when Welshman Andrew Greenland stripped the plastic off his 1997 Honda Dominator and did a ground up rebuild. 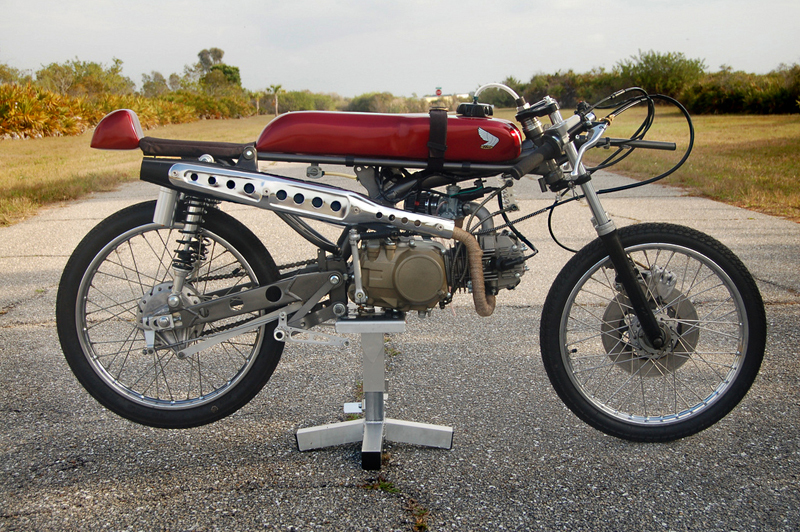 Andrew has a serious perchant for Honda Dominators and he does them impeccably. This isn’t the first Dominator he has built, and by the sounds of things it won’t be his last. If having your handy work plastered up here on the pages of Tube deTemp Rouge earned you some sort of shiny golden statuette of a stylised, airborne motorbike with a windswept pilot barely managing to hold on while his rattly steed heads for the heart of the sun, then the boys at Evolution Motorsports would be kicking back right now, feet up, staring at four of the things up there on their greasy, old spark plug infested mantle piece. Undoubtedly the initial honour of owning one will have worn off by now, and the first spate of polishing and dusting and showing it to everyone who entered the shop will have subsided, now replaced with casual comedic additions to them including a beer bottle cap as a hat, some racing numbers added with a sharpie, and even a stupendous appendage grafted onto trophy number 2 using some used pink gum. But why? Because of late they have had something else to occupy their crafty, talented minds. What have they been cutting their fingers on and greasing up their cuticles with, you ask? This is what. Most motorcycle shops start by building bikes for a living and then end up printing the odd tee with their logo on it to sell on the side. Not these guys. They started a clothing label that now builds bikes on the side. Uprising is label designed by two guys from Jakarta, Ariadi Poernomo and Pedi Tahir. 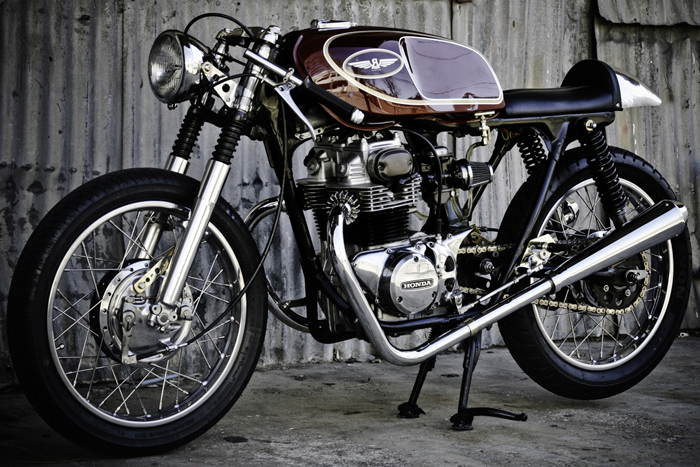 “30 year old kids with motorcycles in our hearts,” says Ariadi. “Our clothing is coming out later this year and we’ve always teamed up with local talented builders to make our rides; we’ve decided we wanted it to be part of the brand… which is why all our bikes are a collaboration. But sooner or later we are planning to have our own workshop. 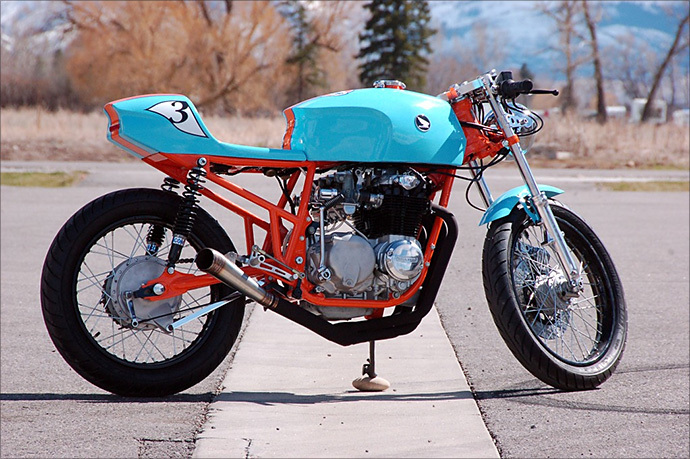 We do sell these bikes afterwards, so we can build more new stuff.” They have many bikes on the go at the moment but their latest is this stunning 1969 honda s90 café racer. Living in Australia we sometimes forget how cold it can get in other parts of the world. On the recent Pipeburn ride I heard many grown men whining about how cold the early morning was in Sydney and it was only 16˙C (60˙ fahrenheit). So I take my mohair beanie off to guys like Aaron Ruse from Illinois who has spent the last American winter building a bike in freezing temperatures in his unheated concrete garage. Aaron is a young guy who recently decided it was time to learn some wrenching skills and build his first bike. “I got interested in motorcycles last summer as a way to learn about basic mechanics,” says Aaron. 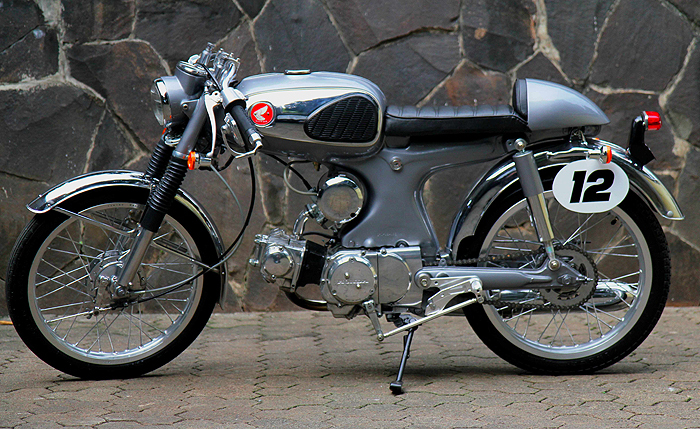 This interest quickly grew into a love for classic motorcycles. 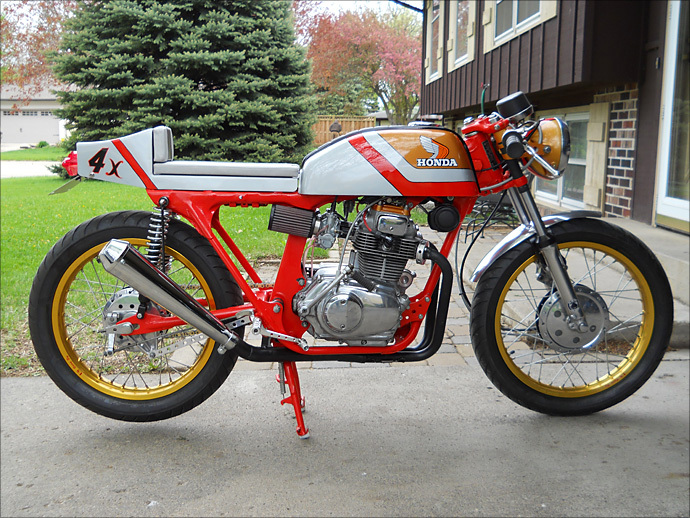 He was inspired by his uncle R.J. Ruse and his buddies who restore classic bikes, along with a new friendship with Team Hansan Racing’s Terry Naughtin, and set out to build a cafe racer last winter. 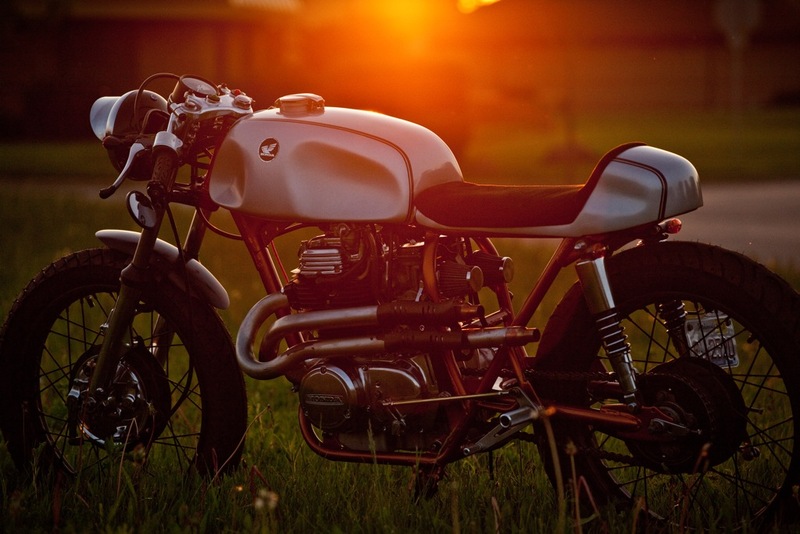 “I found a beat up ’75 CL360 and a badly dented and rusted CB350f tank in a back junk yard of a local motorcycle shop and set to work”. 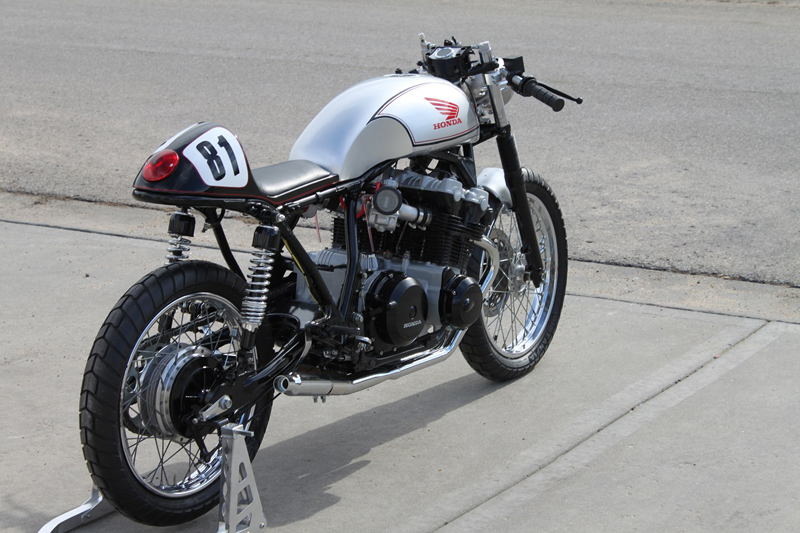 I stumbled upon this thing of beauty on a blog called Anatomy of a Cafe Racer. 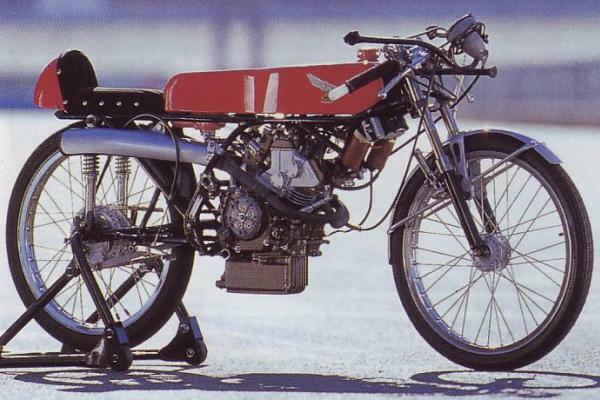 The bike was built by a talented young guy from Kansas called Pete (AKA Pistol Pete). After building it over a two year period, he finally finished it last week. 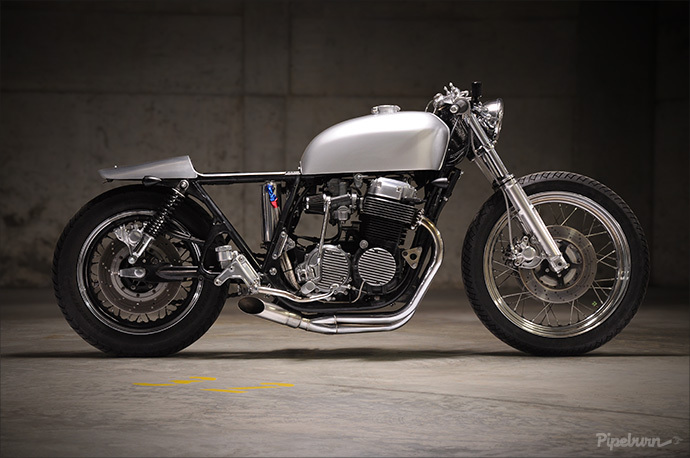 I wanted to find out more about this classy CB café racer, so I got in contact with Pete and asked him a couple of questions.